This advanced cassette deck was a fine example of the way Bang & Olufsen employed new technology to obtain useful functions with easy, logical operation. Microcomputer intelligence was the basis of many of the Beocord's unique features, including the use of real time (actual minutes and seconds) to measure tape consumption. You knew exactly how much recording time was left on your cassettes, so that you could fit in the various tracks precisely without wasting the last few metres of tape every time. Once recorded, the same microcomputer could find individual tracks for you, too. Just key in the address (counter of reading) of the passage of music you want to hear. The cassette fast rewound to that position and played the track automatically for you. Recognition between chrome and ferric tapes was automatic: a manual switch selected metal tape characteristics. The M&X record/replay head was made of a special type of super permalloy and Dolby B Noise Reduction was included. Beocord 6002 incorporated Bang & Olufsen's (then) latest HX-Professional recording system (HX-Pro), developed in co-operation with Dolby laboratories. This technique effectively extended the recording headroom (peak-level ceiling) of all types of tape, and operated automatically during recordings to give stabilised frequency response, wider dynamic range and better signal-to-noise ratio. In other words, you got disc-quality sound from normal ferric or chrome tapes, so you didn't have to buy expensive metal tapes for professional-sounding recordings. An electronic Peak Programme Meter registered recording level, which you set by separate sliders for left and right channels. The electronic clock and 24-hour timer allowed you to make recordings or play a tape automatically at any pre-set time. 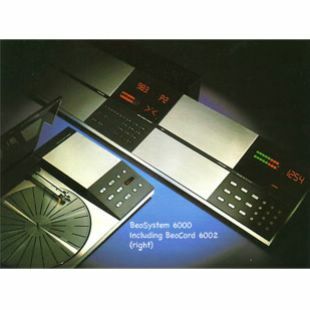 Beocord 6002 could be used as a stand-alone tape cassette recorder or as part of hi-fi systems such as Beosystem 6000 or Beosystem 8000.